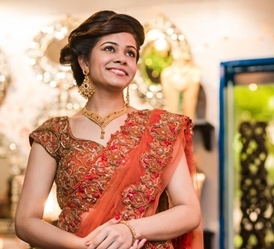 As part of our initiative, WeddingSutra on Location, we invited four brides-to-be to a unique experience at The Ritz-Carlton, Bangalore’s newest luxury hotel. 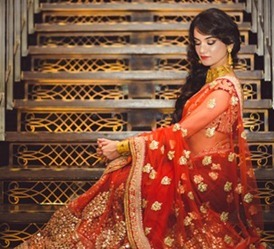 Each bride was introduced to and interacted with some of the best names in Bridal and Wedding services, which included being treated to a personal Style Consultation, followed by a Makeover and finally a Photo-Shoot! Here, in the finale of the four part series Dr. Divya James from Madurai blogs about her experience with WeddingSutra on Location at The Ritz-Carlton, Bangalore. "When my wedding planners Divya and Vithika suggested I take a shot at being part of the WeddingSutra on Location shoot to be held in Bangalore, I was excited! A chance to look and feel like a bride even when it’s not your 'D' day? Well! That was something. When WeddingSutra replied with the good news on my selection I was initially a little confused with my wedding being just a few days away. But I decided to take a break from the chaos and flew down from Madurai to Bangalore. And it was absolutely worth it! As soon as I arrived at the lobby of The Ritz-Carlton, I met the professional, warm Team WeddingSutra who introduced me to the experts. 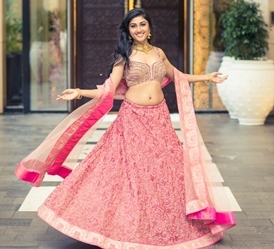 The Lehenga wardrobe, by Monica and Karishma of JADE, Mumbai was incredible. Monica and team suggested a breathtaking lehenga with a unique halter neck blouse which they thought would suit me. It was fantastic! The gold jewellery was from Nikhaar and complemented the look perfectly. Ralph Daniels, Bangalore’s ace make-up artist did my make-up to complement the lehenga and work with what would enhance my features. He decided on a smokey look (more details below). Carlos, the outstanding hair artist from Rossano Ferretti salon (at the Ritz-Carlton) decided on an up-do for my hair. It looked lovely and I was very happy! Finally, the photography session with Dev Purbiya was fun and stylish with a lot of candid poses. Overall, the team was so welcoming, the entire experience was professional, beautifully planned and with a very modern efficiency. It was absolutely worth it and just what a bride-to-be would need! Divya’s Look Divya had no qualms or reservations about experimenting with her look. It was quite easy to make her already beautiful, dusky skin look gorgeous. Ralph started with a hydrating moisturizer which he let sit on the skin for a while before patting away excess oils with a thin tissue. He then dotted her face with the Lakmé Absolute Face Stylist Foundation in Beige Honey and blended it in using a buffing brush in a circular motion to make it look seamless. He then added a touch of the Lakmé Absolute Face Stylist Concealer in Honey shade. He then set the T-zone with the Lakmé Absolute Face Stylist Compact in Beige Honey, leaving the rest of the face untouched and luminous. Ralph decided to give Divya subtle smokey eyes. He blended the Lakmé Absolute Color Illusion Pearl Shadow in Smokey Pearl on her eye lids. He lined her upper and lower eyes with the Lakmé Absolute Kohl Ultimate and then blended the lines into the Smokey Pearl eye shadow. The brows were groomed into shape and the brow bone was highlighted with the Lakmé Absolute Eye Chromatic Baked Shadow in Day Shimmer. Her lashes were curled and finished with two coats of Lakmé Absolute Flutter Secrets Volume Mascara. The cheeks were highlighted with the Lakmé Absolute Sun-Kissed Bronzer. Lips were moisturized and finished with a dash of Lakmé Absolute Gloss Stylist in Coral Sunset to make them look fresh and healthy. Getting married in 2015 or 2016? Would you like to be a part of WeddingSutra On Location*? Write to us at editor@weddingsutra.com with your name, link to your FB profile and wedding date. Selected lucky winners will receive a complete ‘Bridal Wardrobe’ consultation on how to pick the wedding outfit that perfectly complements your body type & personality. You can also explore the looks you prefer with a trial makeup session and professional photo-shoot.